The nursery is a direct result of our current economy. I became unemployed in Oct. 2009 when the automobile business where I was employed for 23 years was shut down. The most common advice I heard was, “do what you love, love what you do”. “Can’t say I’ve done that in any job I’ve had up to that point”. Thus the thought of the nursery came about. The endeavor started with a very small greenhouse which gave way to a much larger one which multiplied the idea of starting the business which is continuing to multiply in many different ways. My favorite being the awesome customers , new and repeats, that make the work that goes in here fun and rewarding! 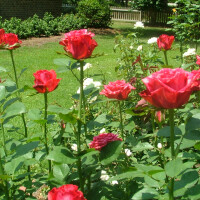 The nursery offers some of the best roses you can buy. The hybrid teas and floribundas have each been hand grafted to fortuniana rootstock, the absolute best root system for our sandy soils. We are also excited about supplying you with some of the newest and best in low maintenance roses. We are licensed to grow Weeks Roses, these along with many others will provide you the best hand picked varieties that have proven to perform well in our area. There is also an exhibition garden here where you can pick out the type of roses that you would like to grow in your own garden. Realizing that gardens are more than just roses, we also offer many other types of plants – traditional and flowering shrubs, fruit plants and trees, shade plants, trees, and interesting and unusual perennials and all the seasonal bedding plants that round out your landscape needs. We also keep available a 100% organic planting mix produce locally by Longwood Plantation. In 2014 we are excited to introduce a professional timed release fertilizer called Harrell’s Pro. It is a true once a year product that will enable out customers to get the most out of their new, (and established), plants. We will enjoy sharing our love of plants and flowers with you and hope that we can supply you with that special plant that you’ve been saving a spot for. Powered by WordPress | Designed by GravityTechnologies Copyright © 2014 All Rights Reserved.